I couldn't help noticing another Ang Ku Kueh 紅龜粿 store on my way home from regular therapy sessions at Singapore General Hospital so I stopped by to pick some up. 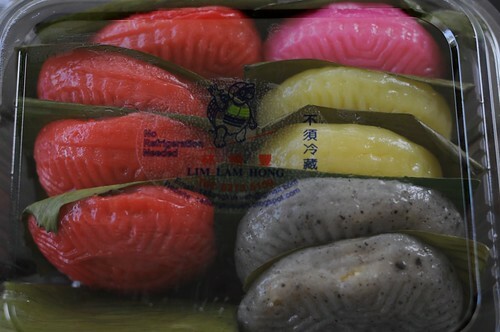 Ang Ku Kueh 紅龜粿 is the Hokkien (a Chinese dialect) name for a steamed glutinous rice flour cake stuffed with a sweet filling. “Ang 紅” means “red”, while “Ku 龜” refers to “tortoise” and “Kueh 粿” means “cake”. 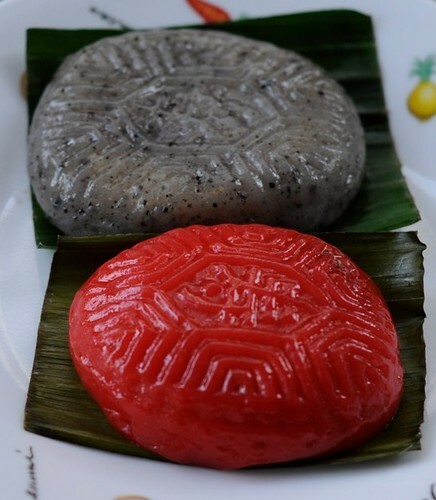 The name is derived from the traditional method of making`red tortoise shell-shaped cakes as a symbol of longevity and good fortune. They were commonly used as gifts for a baby’s first month celebration, weddings or other festive celebrations. Auspicious words are usually carved into Ang Ku Kueh moulds so that they are imprinted on top of the kueh, when they are knocked out of the mould. 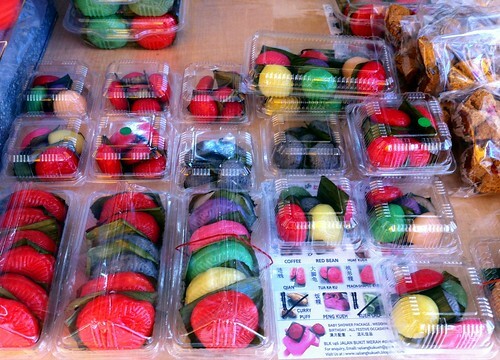 The words on these kuehs read “寿 shou” which means “longevity”. The kuehs are brushed with oil after steaming for an attractive sheen. Ang Ku Kuehs are often eaten for breakfast or as a snack and depending on where you buy them from, are available in a wide variety of flavours and colours, although the most commonly available flavours are Peanut and Green Bean. Like Ji Xiang, the stallkeepers pride themselves on handmade kuehs with manually processed filling. I love Ang Ku Kueh stuffed with ground peanuts. The soft and sticky skin of the glutinous rice cake yields to a sweet, fragrant and slightly crunchy peanut paste. The Red Peanut Ang Ku Kueh here is worth a try. I preferred the Savoury Green Bean filling here as I felt that it had the right balance of sweet and salty and was very fragrant. This is a Must-Try! 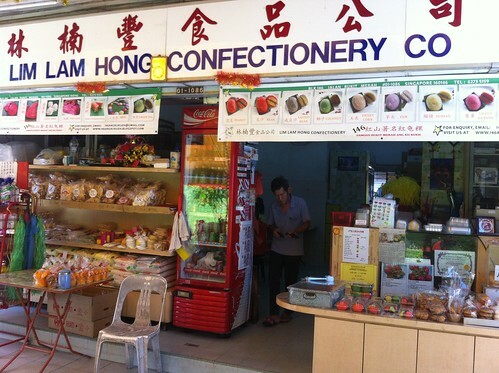 Lim Lam Hong sells normal palm-sized Ang Ku Kuehs and miniatures too in addition to various other traditional Chinese cakes. Mini Ang Ku Kuehs are sold at S$0.40 each. The shop is not all that easy to spot from the road as it's nondescript sign is but a white cloth banner printed primarily with Chinese characters except for the Romanized version of the shop's name, ie. Lim Lam Hong. 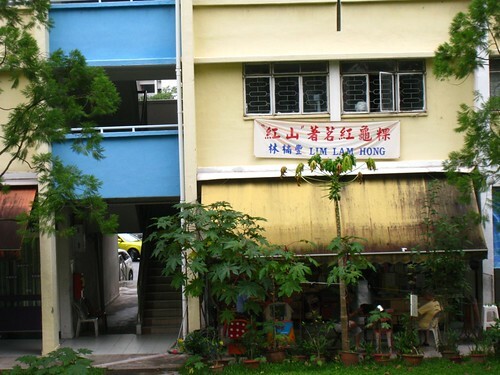 The red characters on the sign reads: "红山著名紅龜粿" translated to mean "Red Hill's Famous Ang Ku Kueh". Quite a few of my friends would not have been able to read the Chinese characters on the sign. I wondered how many potential clients they could have lost due to the lack of translation or rather, Romanization of the words "Ang Ku Kueh". If you're in a hurry, you might shuffle past the shop without realising, as the storefront resembles an old school provision shop. Love the Curry Crab & Drunken Cockles at No. 3 Crab Delicacy!